Today it’s my blogging anniversary!!! Well, it’s one year since the day I started my Facebook page and began sharing my personal life with the world. This was a much less daunting route for me than an actual, real-life website, and it became my stepping stone into the world of blogging. I did not set up my blogging website until less than one month ago, but hey, I’ve got to keep my motherhood story real by being late on something! It has been a complicated journey. Many times I have wondered why I blog. Why do I put details of my life and my thoughts out there? Does anyone really care? What am I hoping to achieve? In fact, I have often been asked that very question, and wouldn’t I prefer to spend any spare time with the children, especially now that I am working outside the home? The truth is, I still don’t know what I am hoping to achieve. All I do know is that writing gives me a break. My blog gives me an outlet, one that I can turn to, to escape any difficulties I am facing. I don’t claim to have a terribly difficult life, and I am fortunate in many ways, but it doesn’t mean my life is perfect. I find focusing on writing keeps my attention on the positive in my life. It helps me stay optimistic, rather than let life’s pitfalls get bigger and consume me. And every time I make someone smile or engage in what I have written, or I relate to a total stranger in a different part of the world, that time I have spent writing is worth it. It doesn’t impact on my children, because I write when they are in bed. The only impact is that they have a more content mother. I started blogging when I was on maternity leave with a 1 year and 10 months old toddler and a 9 month old baby. Prior to this I was still blogging, but only in my head. Having conversations with yourself for too long cannot be healthy. Staying at home most of the day with these two little precious – but very challenging – beings made me crave adult conversation. My brain was desperately crying out to be used, to have the joy of stringing sentences together that required me to think beforehand. To pause for a few minutes to consider something other than nappies, wipes, baby food, baby talk and household chores. I’ve enjoyed sharing my parenting experiences and my complaints about sleep deprivation. I’ve been a mother for nearly three years now and I still learn something new about myself, my children or parenting in general every day, which I love to share with my readers. Along this blogging journey I have had the pleasure of interacting with people from parts of the world I doubt I would otherwise have the chance to meet. I have readers from as far as New Zealand and Hawaii! It has also brought me closer to some of my friends and family, who have been very supportive. I have been fortunate enough to be published in the Huffington Post UK, Sammiches and Psych Meds and featured on Mumsnet.com, so it has been quite a positive experience. Most importantly of all, I have a diary of my journey as a mother to look back onto. There have, however, been some tough times too. One of the light-hearted articles I wrote was misinterpreted by some people and they chose to share it on their own blog and invite others to comment, which included creative assumptions about me and my life. Initially, I was very upset, but as my experience has grown I have learnt that if I am putting myself and/or my words out in the public domain I have to accept that there will be negative comments and even trolls. What I have found harder than the trolls is when some friends or family members have been unsupportive. I am normally a private person and blogging was a big step for me, one that I needed. It did hurt when a few of my family/friends absolutely refused to interact with my page, even something so simple as ticking a ‘Like’ box, especially those that have young children themselves. I was not able to understand it and would wonder if this was their subtle way of telling me how they really feel about me. But as a blogger I have also learnt that I must not take things personally and must keep going, with or without everyone’s support. If you are thinking of starting a blog or any other new venture, go for it, especially if it makes you happy. Not everything in life is to achieve monetary success or fame. Sometimes just knowing you have made someone smile or given them the comfort of realising that they are not alone in the difficulty they are facing, is a substantial reward in itself. It’s so lovely to read a bit more about your experiences Sumbel, and although in one sense you are late to the blogging party having launched on FB first, you may have been ahead of the game in using that approach. I’ve found FB so hard to crack in terms of getting likes and it means I don’t really post much which of course means I don’t get much interaction when I do. FB can actually be a really good place for a chat though (much better than twitter I think, personally) so I think it was a smart move as a way of getting your thoughts out there, sharing experiences and getting feedback in the early days of ‘blogging’. Sorry you’ve had some tough experiences although it sounds like you’ve coped well. I shy away from anything controversial in part to avoid possible difficulties, but your experience shows all it takes is one person with a sense of humour bypass and negativity can come your way regardless. I think we should all probably pat ourselves on the back fro being brave enough to blog! Totally agree with you on that penultimate paragraph – there is so much reward in those things. 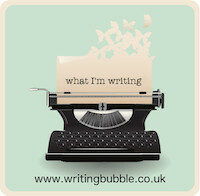 Thanks so much for linking to #whatImwriting! Welcome to our little community! Thank you Maddy. I do have to say I prefer the engagement on Facebook than Twitter. It is hard to get Likes (and sometimes demoralising when you don’t) but if you stick with it and post regularly it does help. Sounds like you’re blogging for exactly the right reasons – to have a creative challenge and a space to think things through with words. I wish you all the very best with your writing. And best wishes for 2016!